The betting bankroll now stands at £2205 after Encore D'Or landed gamble in the Betway Sprint at Lingfield last Saturday, 4-1 into 2-1 for nice £200 profit .The stakes now increase to £88.00 . Moving on to Saturday we have top quality six furlong Sprint at Meydan.16 runners declared for the Nad Al Sheeba Turf Sprint .Big Field though just the three standout contenders Baccarat , Ertijaal & Jungle Cat . BACCARAT : 9-Y-0 Chestnut Gelding ,winning 7 out 28 on turf , winning 3 out 6 at Meydan .Also finished second in this race last year .Been in fair form this season at Meydan ,including winning small handicap over C&D at Meydan last month .Should be thereabouts,though has bit to find with the two main contenders . 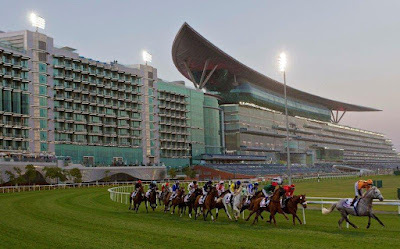 ERTIJAAL : 7-Y-0 Bay Gelding ,winning 9 out 18 on turf .High class sprinter with an excellent record at Meydan winning 7 out 12 .Been in great form this season at Meydan winning both starts over 5f,including winning the group two Meydan Sprint last month .Obvious claims in this easier race. JUNGLE CAT 6-Y-0 Bay horse ,winning 5 out 28 on turf .Goes well here at Meydan ,including winning this race last year .Made winning seasonal reappearance in the 7f group two Al Fahidi at Meydan last month.No problem returning to this shorter trip .Also should get the race run to suit,with plenty pace in the race. Solid each-way claims . VERDICT :The speedy front runner Ertijaal is 5lb clear on official ratings,and will be popular after winning 5f group two contest last time,has winning form over this 6f trip (2 wins out 6) though is clearly better horse at 5 furlongs (6 wins out 7 ). Odds around even money look poor value over this longer trip. Last years winner JUNGLE CAT has bit to find on official ratings,though was only nose behind Ertijaal in 6f G1 Al Quoz last season.Produced a career best, when winning the G2 Al Fahidi last month at Meydan.Looks the solid each-way bet,against the short price favourite . Thanks mate ,won nicely.Good ride by William Buick. Well done Jerry,your flying mate.Three in a row.Thanks. Thanks ,yeah on decent run at minute . Unfortunately nothing for this weekend mate.